Beyond TV and SageTV are two competing Home Theater PC software programs that allow you to turn your home computer into a high octane TIVO-like device. After using BeyondTV for several years and building up many recorded shows in BTV, I began testing SageTV and ran into one annoying stumbling block that has been bothering me for a while. 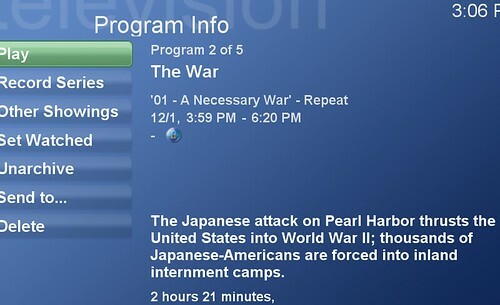 SageTV didn't recognize the metadata such as recorded date, show information etc. To make matters worse, SageTV required me to import those shows into the video section under a separate menu from the recorded shows. With the help of Fonceur on the Snapstream forums and Nielm on the SageTV forums we now have a simple solution to this problem for anyone migrating from Beyond TV to SageTV or even for those who might want to take SageTV for a test run. Why not just leave your old recorded shows (recorded in Beyond TV) in the videos section of Sage? 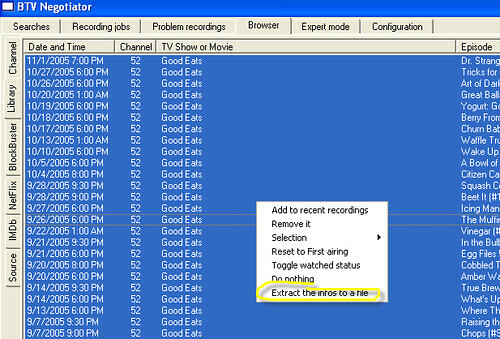 Your shows that were recorded on other DVR programs don't import into SageTV as shows. Instead you have to import them into the video section where movies reside. While this is a workaround that is functional, it isn't convenient to have some recorded television shows in your video folder mixed in with all of your movies and other television shows in your recorded TV section. Download BTV Negociator 4.1a or newer. The latest version can be found HERE (Note this feature was added to Fonceur's excellent add-on for BeyondTV. Fonceur is one of the most talented non-Snapstream affiliated, BeyondTV developers. 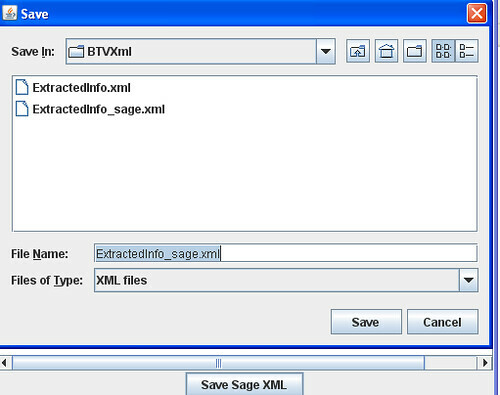 Right-Click with your mouse to see the execute menu and select "Extract the infos to a file"
You will now have a file named ExtractedInfo.xml in BTV-Negociator's folder (same folder BTVN is located) - this single xml file includes all of the metadata for each recorded show from beyondtv that you selected. Next completely close Beyond TV. Close BTV Viewscape and BTV Agent - be sure you no longer have the BTV icon in your toolbar. 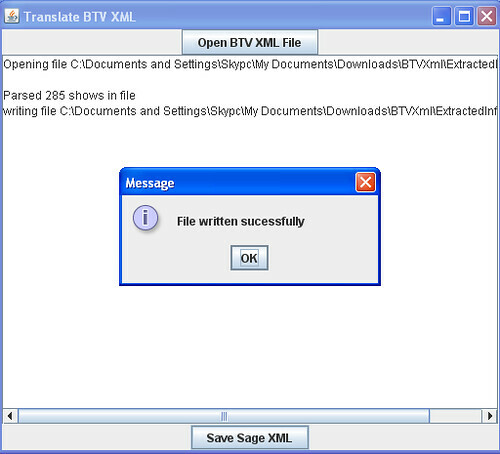 To install "Translate BTV XML", extract the contents of the zipfile into any directory. 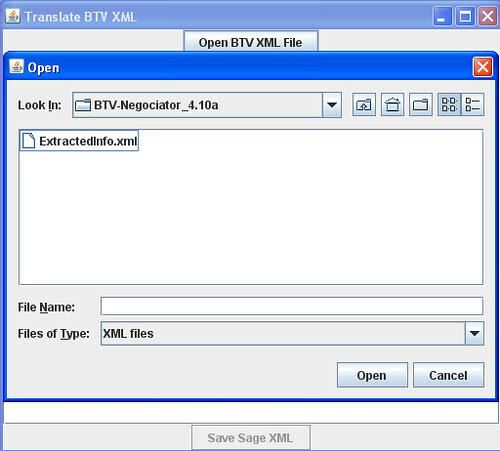 From the "Translate BTV XML" program, click on "open BTV XML file (it will be located in the BTV Negociator directory). Once you select "open", it should say something like "parsed 5 (or however many you have) shows in file"
Click on the "save sage xml" button and select the name and directory to save it to. Remember this name and location as you will need to import this file into SageTV. It should say "file written successfully" when completed. 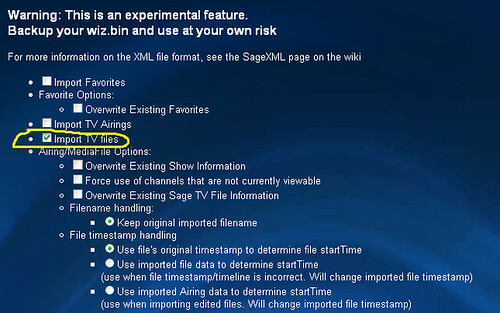 If you already have the SageTV Web User Interface version 2.21 20 or newer skip to step 3 below. Under the SageTV menu item select "Import XML file"
Now on this page, check 'Import TV files' and de-select all the other boxes. At the bottom of this "Import XML Files" page of the webserver, click the browse button and locate the xml file you converted using Nielm's "Translate BTV XML File" converter used above. You will now see each show being imported listed in your web browser and when it's finished it will say "imported # mediafiles". 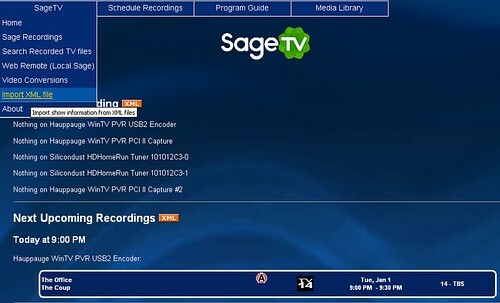 While this may seem like a lot to go through to convert your shows over to SageTV, it is necessary given the way SageTV and BeyondTV maintain their metadata differently. The solution works perfectly and only needs to be run one time if you're converting over from BeyondTV. Thanks again to Fonceur and Nielm for your work to make this process possible.